Jalapeno peppers are part of the pepper family. 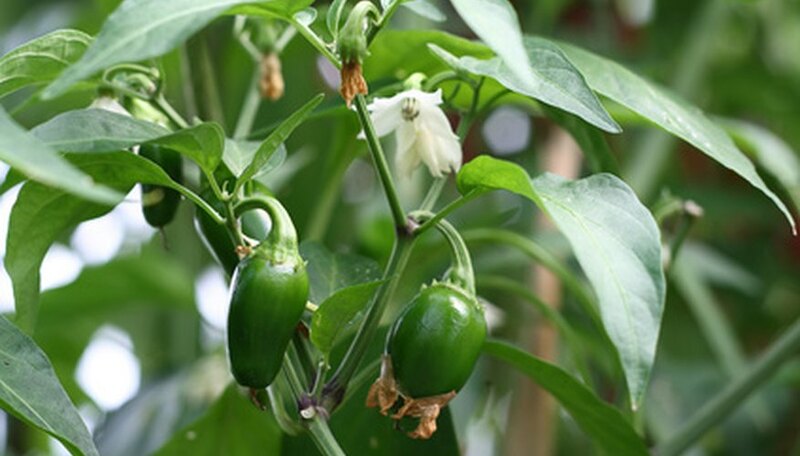 The care of jalapeno plants is only slightly different than most other pepper plants. They are grown and favored for their hot flavor. They are naturally rich in potassium and vitamins A and C. Due to the intensity of the pepper, people usually usually serve it as a condiment rather than a vegetable. Peppers are generally started from seed indoors during the late winter and transferred outdoors in the spring. Plant peppers twice a year, providing temperatures are warm enough. The first crop can be planted in late March or early April and second in late July to early August. The main point to focus on is that all danger of frost is past. Peppers grow well in warm temperatures and will slow when temperatures get cooler. A rule of thumb is nighttime temperatures should be above 55 degrees. For peak performance, jalapenos prefer daytime temperatures between 70 and 85 degrees. Jalapeno plants should be planted 18 to 24 inches apart if planting is done in rows. If you use a staggered approach to planting, individual plants should be spaced 14 to 18 inches apart in all directions. Do not plant jalapeno pepper plants close to other types of peppers as the plants may cross-pollinate, causing sweet peppers to take on some of the heat of the hot peppers. Jalapeno pepper plants need well drained, fertile soil. Fertilizer can be side dressed–added alongside the base of the plant–once the first peppers appear. They need consistent moisture throughout the growing period. Arid conditions and dry soil can prevent the plant from producing peppers. Watch for aphids on the underside of leaves and apply insecticide recommended for peppers. If you purchase plants, avoid purchasing any that have spotted leaves, as they may carry a bacterial infection. If you use tobacco, clean your hands thoroughly before handling peppers to prevent infecting the plants with tobacco mosaic disease. Jalapeno plants take 70 days to produce peppers. Jalapenos are ready to eat at all stages of development from the immature green to the mature red; some people can tell the difference in taste. Technically, jalapenos are fully ripened when they show small cracks at the shoulder of the fruit. A small dark patch appears and the beginning of a color change is present. Harvesting regularly stimulates growth and production. The heat that jalapenos and other hot peppers create comes from an oil they produce called capsaicin. It originates in the white membrane that attaches the seed to the fruit. Handle peppers carefully. The oil is very potent and easily transferred to your skin, and then to your eyes, nose or mouth through rubbing.